Welcome to the Charity Bloghop! I’m so excited for today….as you’ll hear the story in my video, a stamp set inspired me to get some friends together to share the idea of giving to charity in the name of a loved one….it’s not “my” idea, lots of organizations do this, but not everyone has heard about it. You can give a llama, a school scholarship for a girl, gifts to save animals from abuse, gifts for new moms, adopt a wild animal, help entrepreneurs, – there’s even a sewing machine or bolts of fabric for the perfect gift for a crafter. Today…you get to hear from a whole bloghop full of crafters who are excited by this idea too! The hop list is later on in this post – and I encourage you to visit ALL the blogs and leave comments so you can qualify to win PRIZES! (more info on that later too!) But for now…let’s get to them goats! 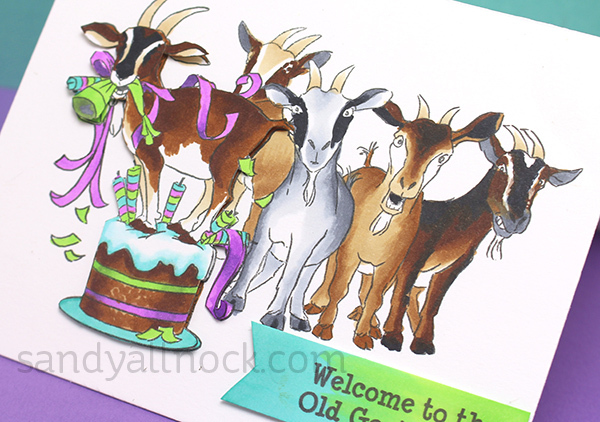 The stamp set that inspired this bloghop is from Art Impressions – not only is it a hilarious goat stamp set, but fun to color too. You know me, I love coloring! I colored up the goats while telling about the idea for the hop and how gifts like this work. And my love of goats. Watch the video or click HERE to see it in HD on YouTube! Aren’t these the cutest goats!? So fun fun fun! I googled goat photos to find different interesting fur markings for my goats. The inside of the card – it came out so cute! I added a doodled plate, crumbs, and leftover confetti! Awesome companies are helping inspire you to hop along and leave comments on all the blogs – Altenew ($30), Lawn Fawn ($50), My Favorite Things ($25), and Ellen Hutson ($25)! Be sure to go say thanks to them on their social media for helping get the word out about giving…and leave comments by Wednesday March 22. Winners will be announced on Sandy’s blog on Thursday March 23, along with a total amount we’ve raised together! Sandy Allnock – you’re here! Love the card, and the organization is such a great idea! Love the charities and this giveaway! What a blessing. The goats are so cute!!! You do so many good things to help charities and you are making a difference! Ths is such a wonderful idea! I love the stamp, but I really lovethe giving inspiration! Last year for Christmas, we ended up trading the same $100 worth of gift cards between our family,I think maybe this year we do this instead! A much better use of the money. What a great idea! Love your card, especially the inside. Thank you for bringing awareness. this is such a good idea! The goats are hilarious! This is a great way to get people to know about these charities and to motivate them to donate. Your card is hilarious! I love the inside where you doodled the plate with the cake crumbs. Very clever! Thanks for sharing! This is an awesome idea! And I love your card. 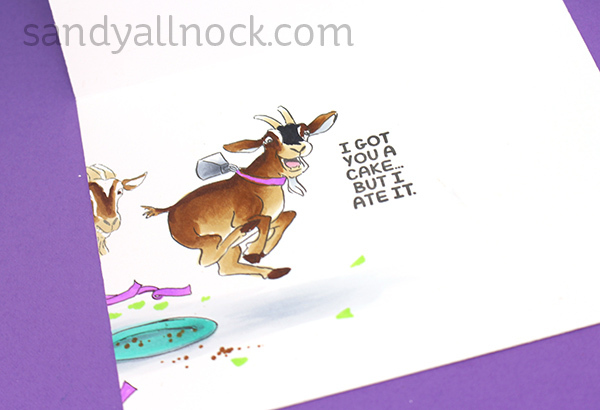 That goat on the inside looks so happy, and not guilty at all, he ate that cake. Love it! 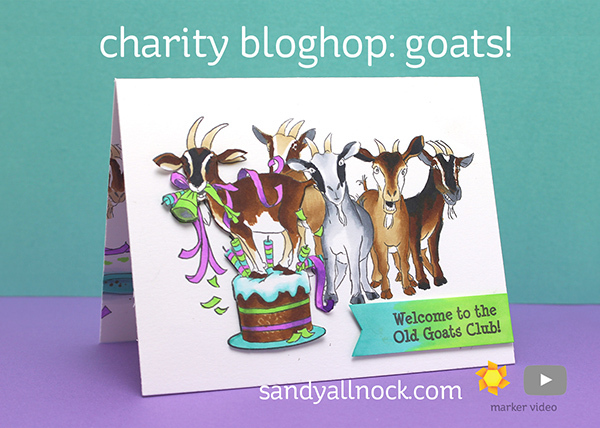 This is such a fun card and very meaningful hop, my husband and I donates to three squares on a monthly basis, and the money has been helping lots of hungry kids and provide them lunch for many years! Love these goats and how your colored them. We have a few goats on our hobby farm and they are always entertaining. Super cute card and the music in the video made me laugh. I enjoy following your work and will definitely research into this organization more.